Beer of the Month Club Review - The Craft Beer Club You Should Know? Beer of the Month Club Review – The Craft Beer Club You Should Know? Join today and get $25 off any annual subscription order. Founded in 1994 by Kris Calef and still family run, The Beer of the Month Club is not the original beer club per se, but the only surviving beer delivery company of a trend which, according to BOMC's website, began in the 1950's. 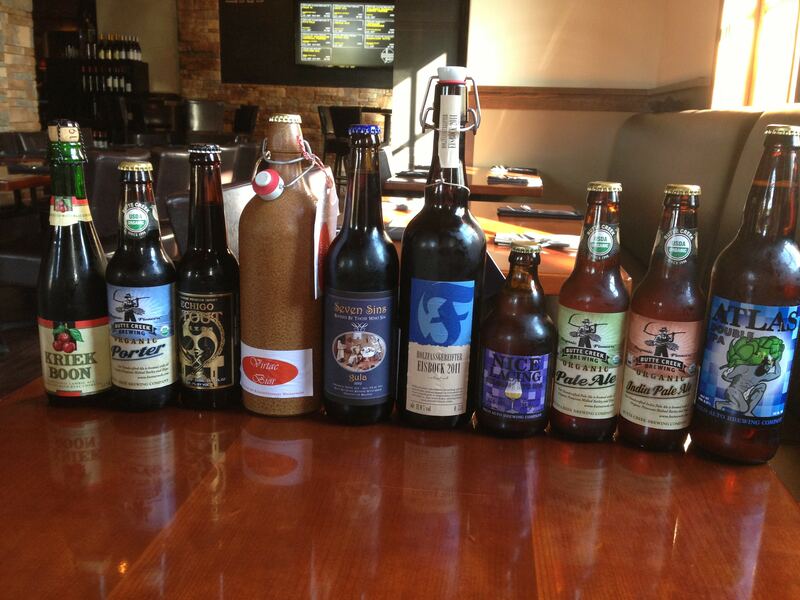 Today beer clubs are flourishing again and of the selection, The Beer of the Month Club is the most venerable. Not content to rest on its laurels, the Beer of the Month Club now has a number of differently themed clubs including wine, chocolate, flowers, cheese, cigars as well as the option to build your own club. For some reason I have an urge to call these 'sub-clubs', even though that isn't a word; the idea that you can belong to the beer club (for example) and come birthdays and holidays gift everyone you know appropriately (also for example). What Makes Beer of the Month Club Unique? Maybe you personally want craft beer, exotic cheese, and fresh flowers delivered occasionally. BOMC is extremely flexible, environmentally friendly, and known for high quality and great prices. Technically, the Beer of the Month Club is now called The Microbrewed Beer of the Month Club, but fear not, because you are in the right place and the website is still www.beerofthemonthclub.com. I couldn't determine why or when the microbrewed part was added to the name. The beer selection is very wide, sometimes veering pretty far from what most of us think of as microbrews. There are 5 beer clubs within Beer of the Month Club: US Micro Beer Club, Variety Beer Club, Hop-Heads Beer Club, International Beer Club, and Rare Beer Club. The beers are hand selected and tasted by industry experts. Excepting the Rare Beer Club, the standard delivery is a half case a month and mixing and matching is encouraged. BOMC encourages you to call them about your monthly order and offers a menu of 'past' beers that are available as well. For all their good features, the Beer of the Month Club doesn't give a comprehensive overview of how the subscription service works on its landing page. You have to sign up to get to that information or call, which is encouraged on every page. The sign-up process is straightforward enough but it has one tiny tic that annoys me personally, which is that you have to 'create an account' to view the club options and prices. Like many of us, I already get plenty of sort-of solicited email, the stuff that isn't technically spam but is the result of signing up here and there just to explore something. The BOMC has such a great reputation that I'm pretty sure they won't sell your email but one can expect occasional reminders of their existence. Other than that, signing up is easy. I recommend taking BOMC's suggestion and calling first with your questions, which you'll probably want to do at some point anyway if you want to personalize an order in a detailed way. It's possible to do everything online but phoning might save you some mental stress. All of the beer clubs are about $50 a month, with both the product and shipping and handling. The Rare Beer Club, which is always an outlier and sends two 750 ml bottles instead of the usual half case, is slightly more per month but S&H is slightly less. In all the range doesn't vary by much more than $6. The S&H is currently a consistent $15 a month, or 1/3 of the entire price. If you ever find a BOMC deal with free shipping, go for it. If you were wondering, Amazon doesn't sell this or any beer, at least not yet. You can get a 1/2 case of beer a month or quarterly, and you can be billed every month or all at once. There is no weekly option. The only quantity options are in the Rare Club, which allows you to choose deliveries of 2, 3, or 4 bottles. Subscriptions can be canceled at any time...by phone, of course. The Beer of the Month Club consistently receives the top rating among beer club reviewers. It's noted for excelling in everything from customer service to quality and packaging. They are a responsible corporation and they even do charity work, such as a little fundraiser for victims of the Napa Valley fire. As for customer reviews, a search of BOMC's site, FaceBook page(as previously mentioned Amazon doesn't sell beer) and even Reddit, we found none at all. If it matters, the Reddit community isn't fond of beer clubs in general. TheBeerAdvocate.com has a closed thread about BOMC. The most consistent complaint was along the lines of 'most of the beers are available at my local grocery store'. Other people loved it. Not to make vast assumptions, but a beer lover living in Manhattan may have a different view of this than a beer lover living in Leadington, MO. The usual complaining about prices tends to accompany the reviews that say that they can source many of the beers themselves. This back and forth is quite consistent. No one complained about broken bottles, delayed shipment (except that somebody has to be home to sign for the delivery) or poor presentation. Most of the disappointed reviewers had received the service as a gift, which may explain why they were unaware of or unmotivated about choosing their own bottles every month. In response to this complaint about limited selection, several reviewers point out that it is easy to select your beers instead of accepting whatever is sent. Beer of the Month Club says that it has 98% customer satisfaction but they don't have a feedback page. Instead, there is an email link and number to call if you feel like expressing your feelings. There are many beer clubs on the market now. Most of them are slightly more expensive than BOMC, but at least one offers free shipping. Given the membership cost to S&H ratio with Beer of the Month Club, shipping costs are a big value consideration. Also, while BOMC offers flowers, chocolate, cigars, wines and cheeses all under its umbrella and most competitors do not, there are several different beer clubs that offer truly rare beers, the kind that will please even our Manhattan customer that can find BOMC's offerings locally. When do the beers arrive? Beers generally arrive the last week of every month and your credit charged is charged the first week of the month. You receive an email a week prior to shipping, which is your ticket to personalize your order. How does the 100% 'Satisfaction Guaranty' work? Beer of the Month Club promises to replace or refund any beer that doesn't satisfy you. What states does BOMC ship to? Beer of the Month Club ships to every state except Hawaii, Alaska, and Utah. With the Beer of the Month Club, this can be a tricky question. This venerable and trusted service is perfect for the right person, even if they try to be everything to everyone. A beer lover who doesn't have much opportunity to shop for beers will love this service, even if they want to hand pick what beers are shipped every month. The person one imagines also appreciates the convenience of shipping packages of wine or cigars to his or her boss, cheese to his or her parents, and flowers and chocolate to his or her significant other, or just likes an occasional treat. If you are a true 'beer snob', Beer of the Month Club might disappoint, and it is true that if you live in a very cosmopolitan place and don't mind shopping, you may find the price high compared to what you get. And we caution against buying Beer of the Month Club as a gift for beer aficionados. Those who frequently shop around for beers to try, are often already familiar with the beers included. The Rare Beer collection is a better choice when gifting, or if you are seriously into beer but like the convenience and reliability of an established business. Beer of the Month Club is certainly a great place to begin experimenting with beer clubs or a nice well-rounded service with whom to belong. Every shipment contains a newsletter and there is definitely a feeling of membership when you join. On Beer of the Month Club's site, we found offers including $10 off single order, 15$ off prepaid 6-month order, and 25% off 12-month order, including a $25 off deal. Groupon also offers a $25 off coupon at the time of this writing. Beer of the Month Club is a solid, reliable company. It tries very hard to keep up with trends and certainly is multifaceted. But is not necessarily trendy in the beer world. Trendiness isn't as necessary to everyone as ultra chic people like to think it is. Did you become stuck on one or two beers in college and want an introduction to today's beer renaissance? Do you live somewhere remote? Do you only want a few nice beers a month? With its excellent history and strong service, Beer of the Month Club is a good deal for many of us, offering good value and reliability. Beer of the Month club certainly isn't the trendiest beer box on the market, but the box does exactly what it claims to do. If you are the in the market to try out a few new beers each month from your home, this service definitely accomplishes that. Instead, of pushing the latest trends, Beer of the Month empathizes value.